We recently came across this amazing cat, an adventurist extraordinaire. Mr. 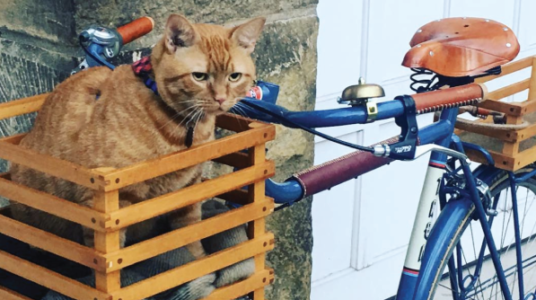 Pig Cat’s human companion is a customer of Walnut Studiolo, an Oregon company that manufactures handmade fine leather bike accessories. We couldn’t resist sharing this dapper fella with you. Here’s the story he “told” Walnut Studiolo. “A few years ago, [my human companion] Audrey watched a movie called ‘A Street Cat Named Bob’ about a cat that got to go everywhere with his owner. Maybe it was the way I glanced pleadingly at her throughout the entire movie, maybe it was the way I drooled as I stared at the TV, maybe it was the incessant roar of me purring for an hour and a half, but eventually Audrey decided she would try taking me out and about to see how I liked the great outdoors, and of course I do.